Having a baby is a dream for every couple, especially for a newly married couple would want to quickly have a baby instead ? In addition, a child is the successor of the offspring for a family, with the presence of the baby will make a household become more harmonious, the house becomes crowded, and new habits will be formed in the household. With the presence of the baby you may be bothered with all activities in taking care of the child, both parents are very important role in growing flowers the baby. So be good at guarding and educating children so that the future can boast you as his parents. Back to the topics in this article, according to the title "7 Natural Ways to Improve the Opportunity of Pregnant Twins", this time I will provide information and a few tips that can be attempted to increase the chances of conceiving twins. Having twins is a silly excitement for parents, perhaps many of us who have often seen videos about twins and their adorable behavior make us jealous and also very eager to have twins. By seeking some of the ways I will give in this article hopefully can help your program to get twins. We as human beings are obliged to strive and God is absolute will to the results of our efforts. Before you apply the following way better round out the intentions accompanied by positive thinking. This will shape your mental and mental condition for the better in planning this twins baby program, and hopefully the results match your intention. 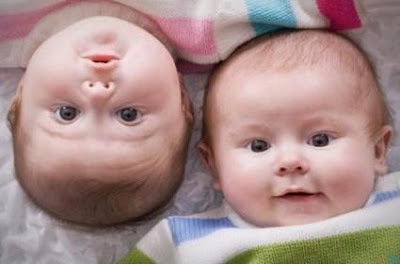 Before planning a program to have twins you should make sure first that your weight is ideal, if weight is relatively thin then the chances of having twins will also be small. For women, this is the first thing to do and should be ensured before starting the program to have twins. if the weight is too thin first rise, if the weight is too fat first to touch the ideal number. For example your height 160 cm, then your ideal weight in general is (160-100 = 60 kg). The next way to do is to take fertility supplements applicable to both couple (husband and wife). Taking fertility supplements can help to quickly get pregnant and increase the chances of getting twins, especially for a wife. Fertility supplements can increase the chances that women can produce more than one ovum during ovulation. This aims to allow the uterus to release more than one egg that has been matured to be fertilized inside the fallopian tube. With more than one ready-to-fertilize ovum will increase your chances of getting twins. Still associated with ovulatory eggs in women, the consumption of folic acid may help improve ovulation that results in more than one matured ovum ready to be fertilized. For women should often consume foods containing high folic acid such as green vegetables, tomatoes, papaya, avocado and marine fish or can also consume folic acid supplements. Actually folic acid is good for male and female fertility, for women folic acid can also function to strengthen the egg and uterine wall so that it can reduce the risk of miscarriage. By taking the appropriate folic acid rule can help increase the chances of getting pregnant fast and reducing the risk of a baby with a birth defect. Women who regularly consume milk and other dairy products, especially cow's milk, will have a five-fold greater chance of having twins. Make sure that you drink is pure cow's milk, and does not contain any other chemical mixtures. Still for women, yams are able to stimulate the formation of more than one egg cell and make egg cells mature faster. Frequently consume yams, thus the chances of conceiving twins become larger. The following way is only possible to apply to couples who have recently had a child or woman who has just given birth and are still in the breastfeeding period. When breastfeeding prolactin levels in the female body is very high, this can be a very important and very appropriate moment for you to plan a program to have twins. Begin the twin program when the wife is in the breastfeeding period or menstrual cycle has been normal after giving birth. You can plan to have twins when your wife is over 35 years of age, research has shown that pregnant wives over the age of 35 and older have a greater chance of having twins than women who are pregnant under the age of 35. If you have never had a child or have not given birth yet and have not reached the age of 35 years, you can still seek to get twins with a way 1,2,3,4,5 course. The above method can also be used for newly married couples to quickly get pregnant and soon have a baby. To support the success of the program has twins, you should also consult a gynecologist or reproductive specialist first. After pregnancy or pregnancy you should also check your baby's condition and pregnancy to your doctor. In addition, healthy lifestyle factors can also affect fertility and pregnancy, exercise routine, sleep enough, do not stay up, and keep your diet and diet and drink plenty of water.